Amtrak recently told a U.S. Senator in writing (from an Amtrak senior executive officer) that elimination of all of the long distance trains (after transition costs) would increase its need for annual federal subsidy, because the same costs would continue to exist but be spread over a much smaller base of activity. That means, quite clearly, that the long distance trains at least break even on operations. While the argument over incremental vs. fully-allocated accounting is entertaining but probably unresolvable, the fact remains that Amtrak itself says that NO federal subsidy is being used to support operation of the long distance trains. The Amtrak reports that purport to show operating losses in the long distance markets are fictional artifacts of management’s internal, unaudited, fully-allocated costing system (originally derived from the Pennsylvania Railroad and the old ICC Form A cost allocation program, designed to maximize allocation of fixed costs to the passenger services of the pre-Amtrak railroads). They do not reflect the disposition of annual federal subsidy cash, and unless Amtrak lied to a U.S. Senator, none of the subsidy goes to the long distance trains. Amtrak’s own annual route performance data shows plainly that, measured by output expressed in passenger miles, and load factor, the long distance trains are by a wide margin the largest and strongest set of trains that Amtrak operates. They produce about half again the annual output of passenger transportation as does the NEC (in FY’14, about 2.761 billion PM vs 1.931 billion in the NEC). Even the several dispersed regional corridors elsewhere in the country regularly produce 105-110% of the passenger miles as does the NEC. Load factors in the long distance trains are higher to much higher than what Amtrak achieves in the NEC, showing simultaneously that the long distance trains are far more capital-efficient as well as being far more under-invested than the NEC. NEC load factors, which run just above 50%, show that Amtrak is materially over-invested there, since it cannot give away nearly half of its existing inventory. Because the long distance trains require and consume no federal subsidy, it necessarily follows that they are Amtrak’s least subsidized segment. If you trace the actual use of Amtrak’s federal subsidy, net of excess contributions to RRTA totalling some $200 million a year, it is clear that the majority of the annual subsidy, totaling some three-quarters of a billion dollars a year, is used to prop up the costly infrastructure of the NEC. The NEC trains, accordingly, are by far Amtrak’s most heavily-subsidized, in gross and per passenger mile. Amtrak’s social relevance in the NEC is dubious, since its market share there for intercity travel (using the BTS definition: non-recurring trips over 100 miles) is less than 2% according to data from the BTS, AAA, and other sources. In long distance markets, Amtrak’s market share varies, but often is in the range of 5%. Its average trip in the west is nearly 800 miles, matching the average trip on domestic airlines. Where Amtrak offers long distance trains, they compete quite well. Finally, because Amtrak has “invested” about a hundred billion dollars into the NEC (in constant 2014 dollars) yet still has a trivial and declining market share and half-empty trains to show for it, the NEC has the dubious distinction of having not only consumed almost 100% of Amtrak’s annual free handouts from the federal government, but also achieved a negative rate of return on invested capital in the process. This is a SPECIAL 10 PHOTO EDITION. All the photos (except one) are from Russ Jackson on his family’s Fall trip across the country. To see these photos larger, click on the photo. To read the full trip report, see “Trip Report on the Texas Eagle and other trains: How was it?” that was posted on this site on November 28. 1. Amtrak’s Texas Eagle departing the St. Louis, MO, station is about to cross the Mississippi River on a cold November day with full view of the Gateway Arch. 2. The Texas Eagle has arrived at the Chicago Union Station platform on a very cold and wintry November, 2014 day. 3. 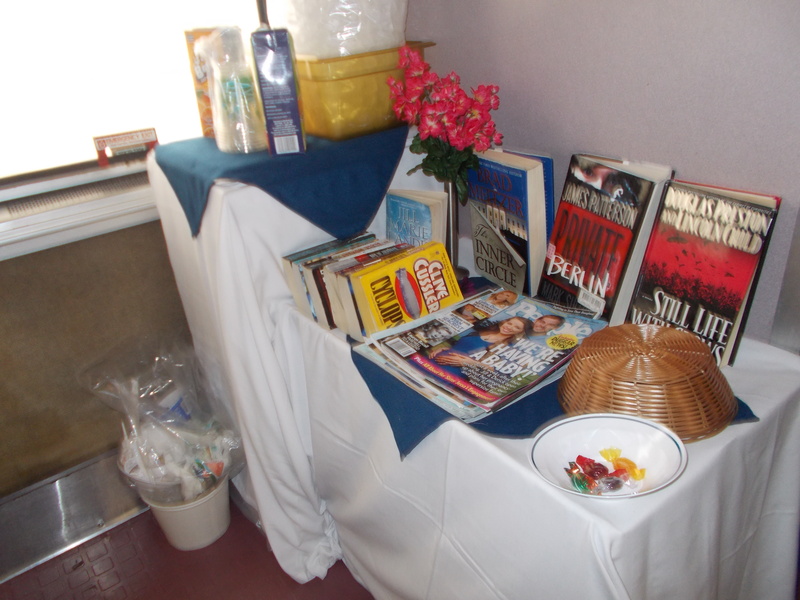 Many Amtrak sleeping car attendants “dress up” the area at the top of the stairs like this one on California Zephyr #5, providing passengers with books and other items. On this trip the ice, fruit juice and coffee were always available. 4. November snow was visible out the car windows across Iowa, Nebraska, and Colorado. 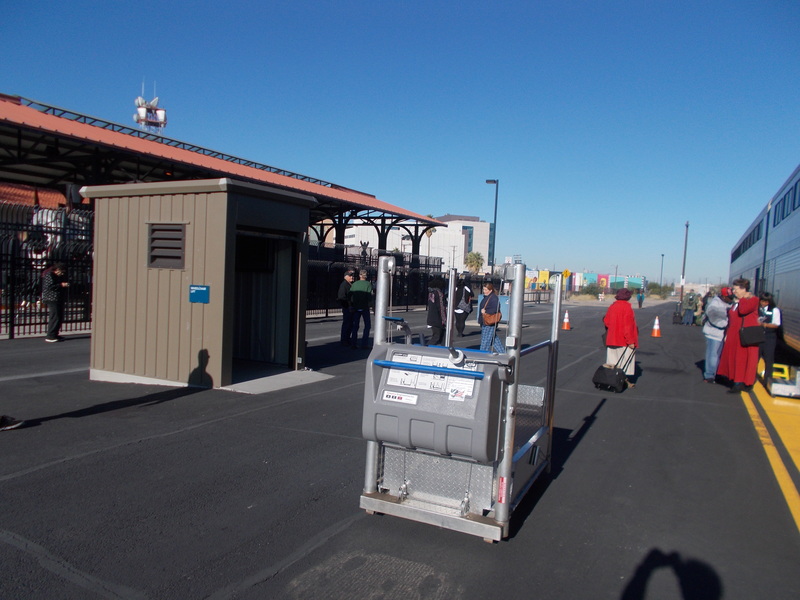 This is the platform at the Denver station just as #5 has arrived. Because of the weather the photographer was unable to visit the newly remodeled station (seen in the background). 5. The trip of the California Zephyr up the face of the Colorado Rocky Mountains in the snow is always a much anticipated view out the car windows. 6. The writer is in better weather on the platform in the Reno trench where #5 has made a very productive stop. 7. 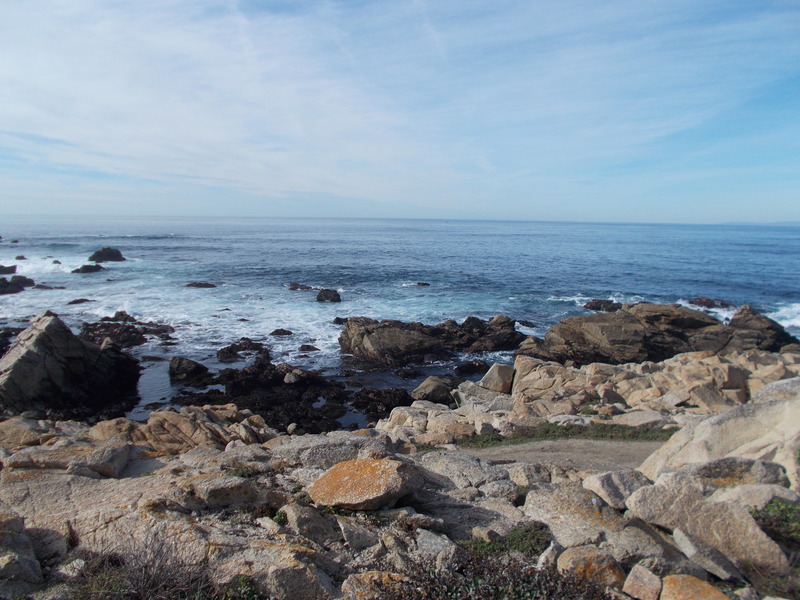 It was a cold day, but this non-rail photo tells the story of the beautiful California Central Coast at Pt. Joe on the Monterey Peninsula 17 Mile Drive. 8. 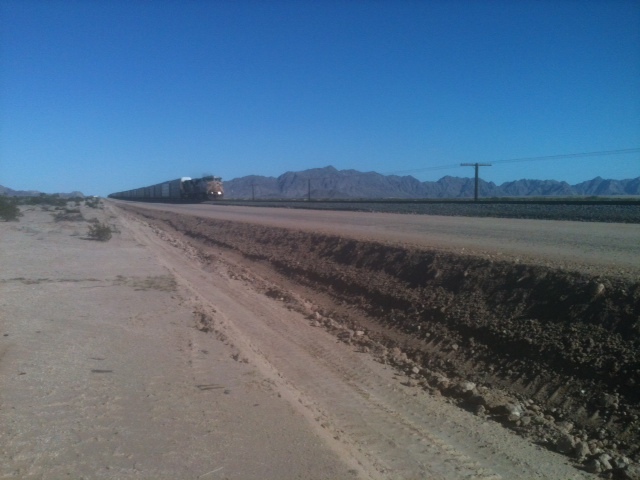 The return trip on Amtrak took us on #422, the combined Sunset Limited/Texas Eagle through car. 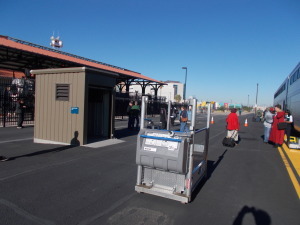 At the Tucson, AZ, station the disabled ramp has been removed from its storage shed to assist loading a passenger in a motorized wheel chair. Note the new-style “stepstool” by the car door alongside the traditional yellow one. 9. 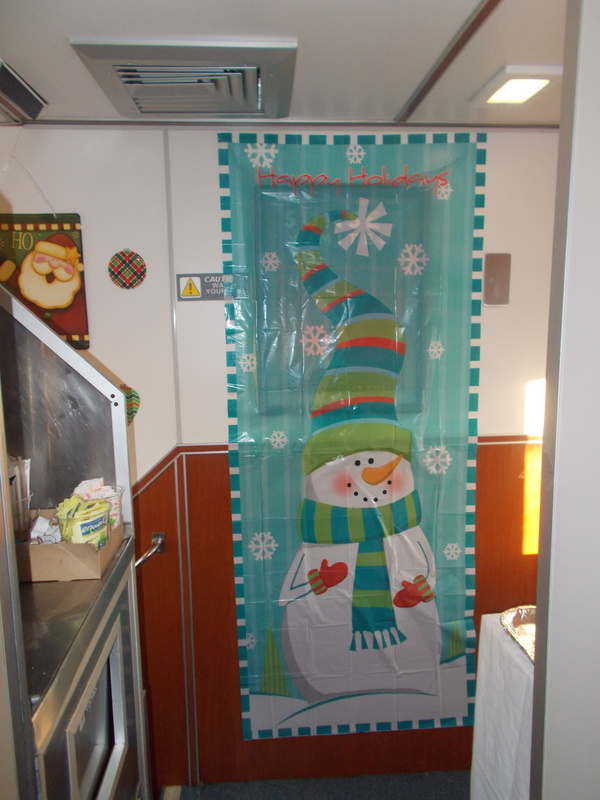 Many Amtrak car attendants decorate their cars for the holiday season. 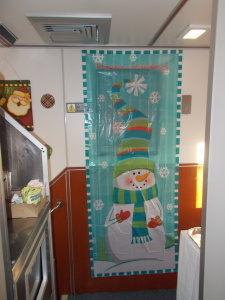 This is one of the displays that Lisa, our sleeping car attendant, provided. Lisa will also conduct holiday bingo games in the Sunset Limited’s Sightseer Lounge on her runs during December. 10. 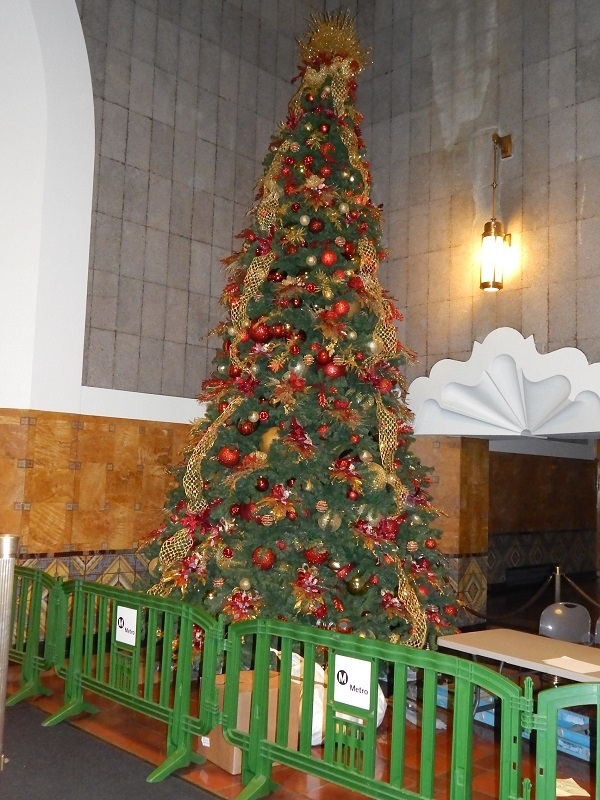 With this photo of the Christmas tree next to the main entrance at Los Angeles Union Station we close our trip and wish all the readers a Happy Holiday from the RailPAC Photo department. 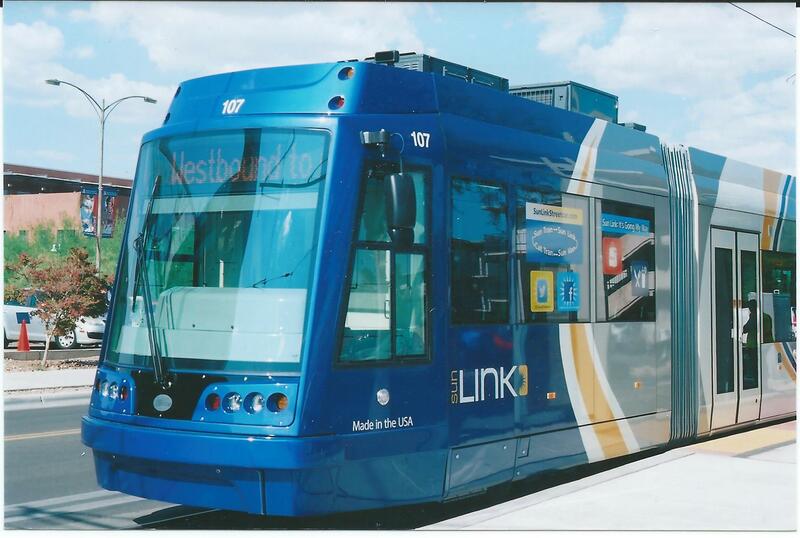 If this picture looks familiar, it was seen first on the December 7 RailPAC e-newsletter. This report writer was standing next to Noel Braymer when he took the photo. Here are this month’s photos by RailPAC photographers! 8 PHOTOS THIS MONTH. LOOK FOR A SPECIAL WINTER EDITION SOON! Contributions to this page are welcome. Send your jpg rail photos to Russ Jackson, RailPAC Photo Editor, at info@railpac.org. Trip Report on the Texas Eagle and other trains: How was it? 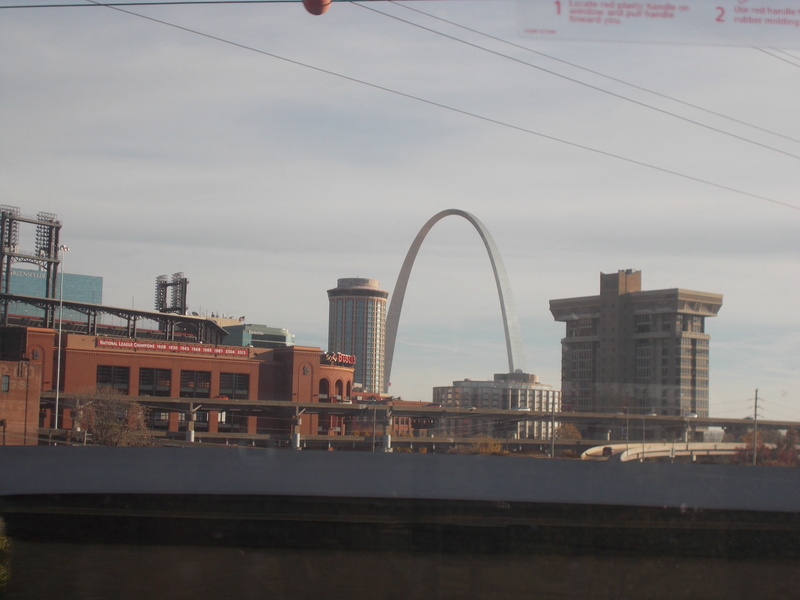 This writer and spouse recently completed a November Amtrak circle trip, starting and ending with the Texas Eagle, which covered much of the western United States. For reporting purposes, the information below primarily covers the portion of the trip on the Texas Eagle, but there will be references to the other trip segments. Was it a good trip? A bad trip? An ugly trip? Like all Amtrak trips on long distance trains each segment had elements of each of those categories. On November 23 the Huffington Post had an article by Ethan Klapper titled, “6 Reasons Why Long Distance Train Travel Is Worth It,” with all 6 reasons well known to all of us in the rail advocacy community, so I will use that outline to cover this Amtrak trip. 1. The Ever-Changing Scenery Is Unbeatable. For the Texas Eagle, the most visible scenery is the area around St. Louis, MO, when riders wake up following the Mississippi River into that city, then departs within full sight of the Gateway Arch. 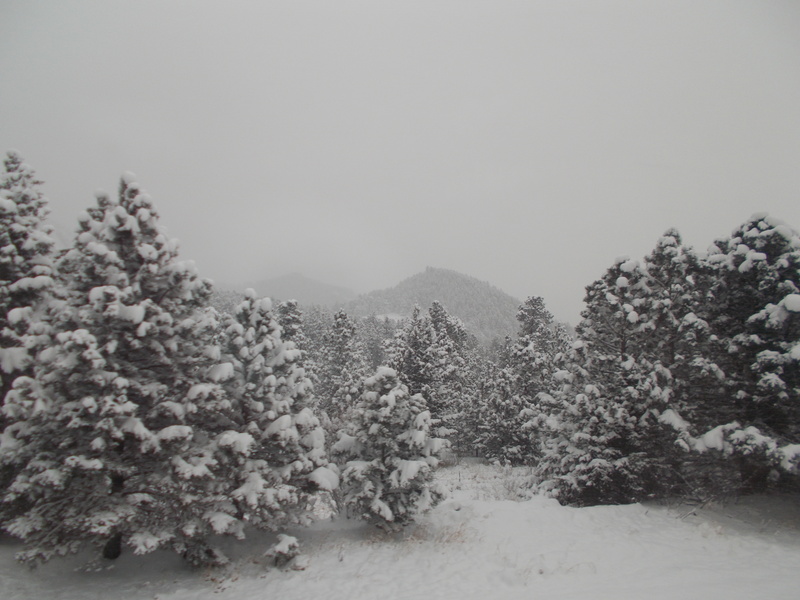 Because our trip also included a trip across the country on the California Zephyr, the pleasant surprise was not waking up to see bare ground with hungry cows and plowed corn fields. Those elements were there, of course, but all were covered with a falling snow. That’s something we don’t see in the Southwest very often. Naturally, that snow extended into the Rocky Mountains and the Sierra Nevada. When the RailPAC Photos of the Month are posted there will be some good snow scenes included. 2. The Passengers. Yes, you see and meet all kinds of people on the long distance trains particularly when sharing a table with them in the Diner, or in the case of the Texas Eagle the Diner-Lounge. We met a lively British couple enroute to Chicago who were just completing their circle trip that was a duplicate of ours. However, they were quite disturbed when they found they could have returned to Chicago from Los Angeles on the Southwest Chief , saving one night of travel. Booking on the internet as they did does not explain the reason for options for first time travelers particularly from another country. For the accuracy of reporting, we can say definitely that people who ride for the first time or continue to ride Amtrak long distance trains do so with a positive outlook. Events that occur enroute can damage that morale, but mostly we found a willingness to accept some hardships. The most frequent complaint heard on this whole trip was the rough ride encountered on track, whether it was on the Union Pacific or BNSF. There are some very rough sections, and many of them seem to be in the night that causes loss of sleep time. 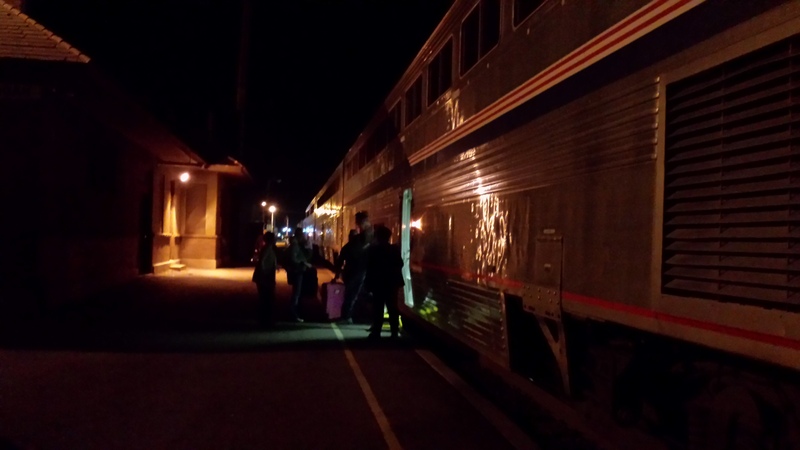 Of course the Sunset Limited-Texas Eagle car shuffle in San Antonio doesn’t help, but when it comes after a very bumpy ride from Del Rio to San Antonio many found sleep elusive. 3. The Staff. Frequent riders always encounter a diversified quality of staffing from trip to trip, and this trip was no exception. Generally, the on-board crews were above the average of what we have found in recent trips. Some segments had crews that kept the passengers informed of not only operations but what to see out the windows, and others were silent. The sullenness has largely disappeared. On our return trip on the Sunset-Eagle from Los Angeles the train was sold out in anticipation of the Thanksgiving holiday, so the staffs were quite busy, but were helpful when needed. 4. The Food. Although we are mostly reporting on the Texas Eagle part of our trip, we can definitely say the quality of the food on all trains was consistently high. The dinner steak and chicken entrees, the breakfast scrambled eggs and the lunchtime cheeseburger are excellent. They should add a BLT on a bun to the menus! The Texas Eagle dining car crew on our November 9-10 Dallas to Chicago segment was outstanding, and need to be mentioned by name: Lorraine, Adrienne, and Stacy worked together and with the passengers probably better than any crew we have encountered in traveling Amtrak for 40 years. Yes, they were that good and it was appreciated by everyone. Patronage was high for obvious reasons. While she won’t be identified, one of them replied to my inquiry about what the “light entree” was by saying, “Don’t order it.” How’s that for honesty? It is a shame that the Eagle still does not have the full dining car in its consist. 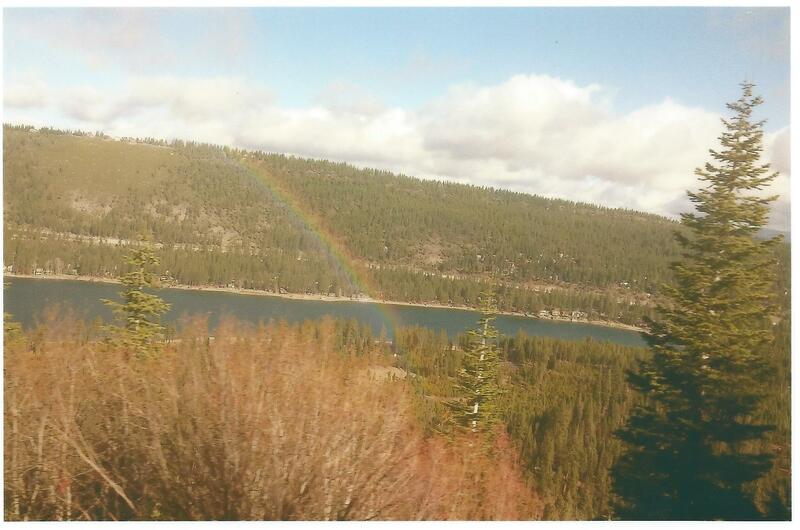 Continuing to the topic of “change,” on November 3 Amtrak made several changes designed to “save money without jeopardizing potential business.” RailPAC’s Jarrod DellaChiesa rode the Coast Starlight just after the changes were made, and confirms many of our observations. The biggest news for railfans of course is the discontinuance of china in the dining cars and all beverages are served in paper or plastic cups. This allows one person to be eliminated from the dining car crew, whose primary duty was to wash dishes. On the Eagle, however, silverware and cloth napkins continued to be used. The menu changes are significant, however, with salads now costing cash customers an extra $3 and there are only two salad dressing choices (Ranch and Balsamic vinegar). Coffee and dessert are also extra for cash customers, but they and the salads continue to be included in First Class ticket meals. Will many cash customers pay $25 for the steak PLUS $3 for a salad PLUS $2 for a beverage? Jarrod also reported the Pacific Parlour Car changes on the Coast Starlight, with wine tasting costing $7 per passenger which has reduced patronage. But, that is now a moot point as Amtrak has announced the Parlour Cars will all be removed for “restoration” in January. They are scheduled to be returned to the rails March 12 according to Amtrak’s release. That’s a long time to hold our breaths to see if that really happens. Will Amtrak have the money to do this job? If they don’t it makes a good excuse to not do it, and discontinue the Brian Rosenwald designed amenity, with fewer employees to pay. 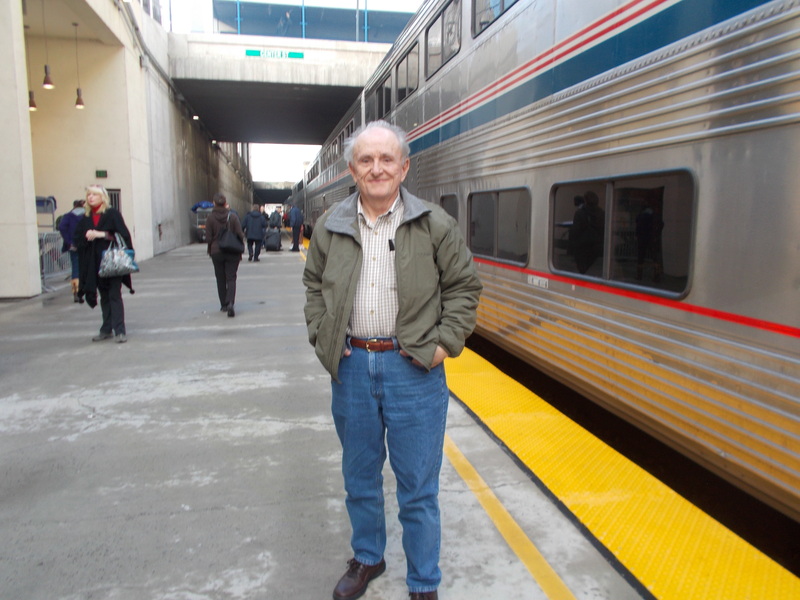 Is a drop in quality of the experience of importance to anyone other than veteran rail travelers? 5. The Sleeping Car. This is where this report enters an “ugly” item. 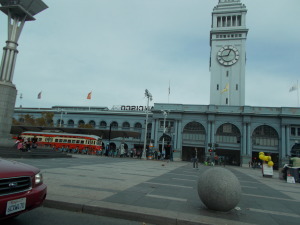 While all the Sleeping Car attendants we had were way above average and very responsive to needs, the one major negative on our trip was car number 32032, which came out of Los Angeles and we boarded it in Dallas on November 9 enroute to Chicago. The car had been leaking water since it departed LAUS, and finally went dry near Longview, TX. Dry as a bone. Attempts to find a hose in Longview and Little Rock were not accomplished, so we were told in St. Louis that it would remain dry until Chicago, and we would have to continue using alternative facilities in the adjacent Transition car. A nuisance, of course, but when passengers spend BIG bucks to have facilities in their deluxe bedrooms, it is more than a nuisance. 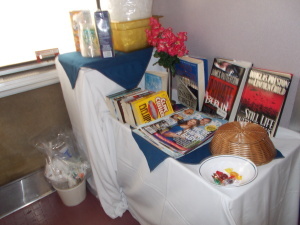 Otherwise, services such as “room service” was available, the attendants were friendly and had water, juice, and coffee available. One thing about boarding the trains, however, was disturbing. At Dallas Union Station the large group of boarding passengers were required to line up while the conductor solved a problem and then finally directed us to our proper car. No ticket scanning was done on platforms on our trips this time, but we were checked in by attendants who reported attendance to conductors. 6. It’s a Great Way to Unplug. Haven’t we all said this all along? 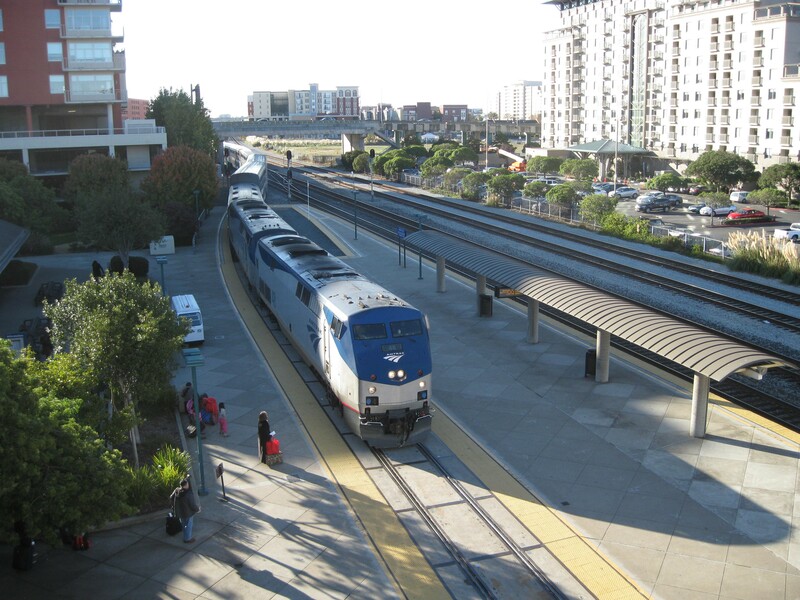 Amtrak passenger trains provide a social service, taking people from one place to another. 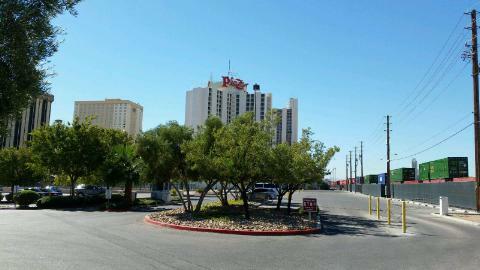 Taking a trip such as we did as a “vacation from retirement” is great, but others have definite destinations. Many of our fellow passengers were going somewhere for Thanksgiving reunions with family, and did not want the hassle of airports or driving. At breakfast on the Texas Eagle a couple coming from El Paso to Dallas told us how much they enjoyed taking this trip, and how they always traveled from their home to Tucson on the train because of the convenience. When Amtrak looks at reasons for the existence of its long distance trains, folks such as these must be considered and not just the end point customers. If downgrading the experience or elimination of the service is in the cards in the future it would be hard to disregard what we heard on this trip: people like the long distance trains, and will ride them as long as the 6 Reasons stated here are maintained to a quality that encourages travel. September was an equally impressive 8.8% over revenue in September 2013.
reliable service in the Amtrak system for the fifth year in a row. high-centered on the tracks running through the Oakland Embarcadero. 92% due to extensive mechanical delays in the first half of October 2014.
accounted for 34% of all late Capitol Corridor trains in October 2014.
half [17%] of what Capitol Corridor passengers experienced in October 2014.
four years ago to 11% today. 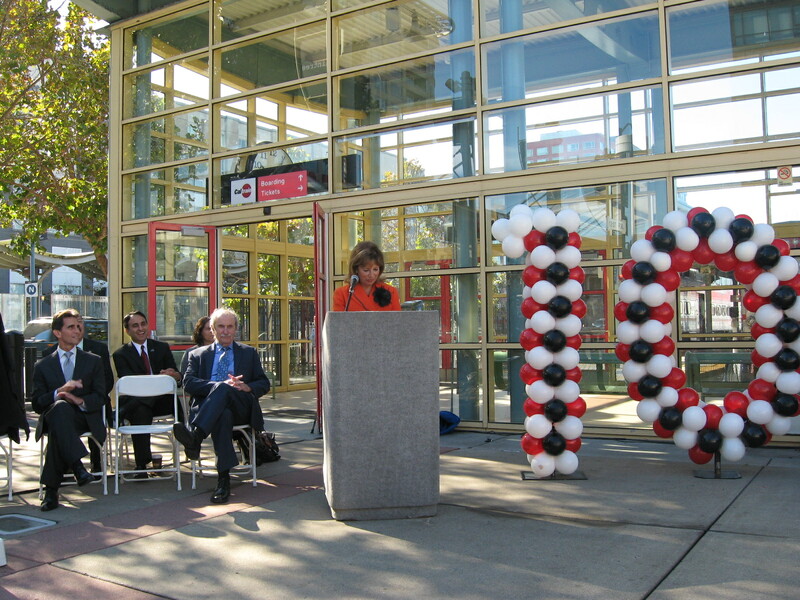 Jack London, and Fremont stations will begin. 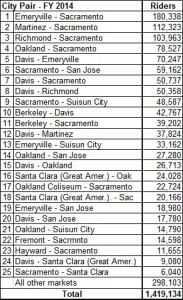 Clara/Great America, Hayward, Oakland-Coliseum, Richmond, and Auburn. California State Transportation Agency (CalSTA). 3% and 2%, respectively, compared to the same six-month period in FY 2013.
frequent, reliable, and high-quality transport service. Long Distance, State-Supported, and the NEC…now what? Comments are those of the writer, not necessarily those of the RailPAC Board. The three categories in the title of this writing are all tied to Amtrak in one way or another. Amtrak, as we know, is the “National Rail Passenger Corporation,” and is the purveyor of intercity passenger rail transportation. Rail fans and rail advocates know the three category differences. Does the public? 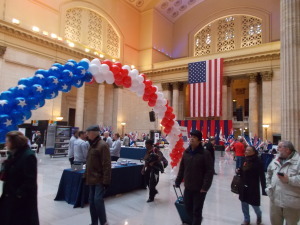 Did anyone hear “Amtrak” or “passenger trains” discussed in the campaign that culminated in the election on November 4? Obviously not a major issue for the public, but it is for those of us who value its service wherever it exists. Since there was no outcry from either side of “passenger rail” can it be assumed that the public likes what it has? Not necessarily. It is up to us to keep the “home fires” burning to see that this mode of transportation continues to exist, and whether it is through Amtrak, the state, county or city in which you live, if you/we want it preserved or changed those in charge need to know because they cannot tell from election results alone. 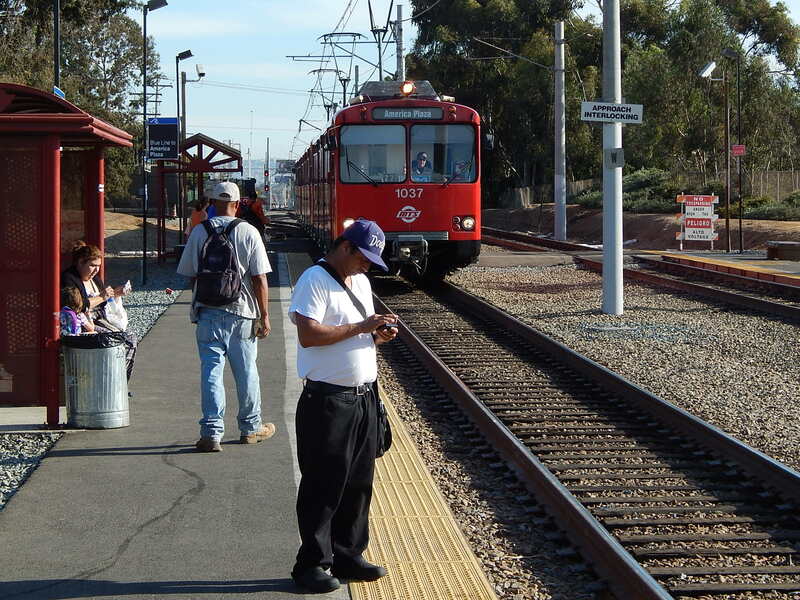 Remember, most of those who have good passenger rail service won’t miss it until it is gone. First, we look at the long distance trains in the west. 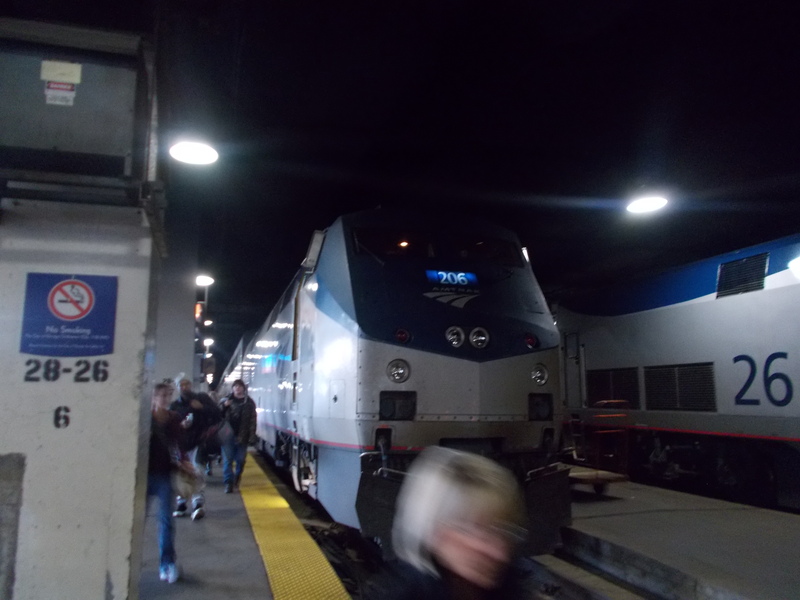 In the previous post by this writer there was a report of the on time performance problems suffered by Amtrak and its riders this past summer. The problems of the two eastern trains that terminate in Chicago using the Norfolk Southern line west of Cleveland have been partially solved, but both continue to arrive in the Windy City upwards of two hours late. The trains to/from the west that originate or terminate there are doing reasonably well, but there have been some exceptions. Most notable was Train 7, the westbound Empire Builder that departed Chicago “on time” on October 26 arrived in Seattle 16 1/2 hours late, due to problems encountered enroute. The next day’s departure of Train 7 arrived in Seattle 21 minutes EARLY. On October 28 Amtrak announced it had established a “blue ribbon panel” to address Chicago rail gridlock, and is charged with identifying “infrastructure and operational improvements” that “will optimize Amtrak on-time performance and improve freight rail service.” That report is not due until May, 2015. We can only hope problems will not last that long, as the devastating effect on Amtrak train ridership and revenue has begun as a fallout of the situation there. In regard to the ridership and revenues, on October 27 Amtrak issued a report trumpeting continued growth in fiscal year 2014. Amtrak’s total ridership was 30,921,274 and its total revenue was $2,188,654,846. That’s all well and good, but in the national (long distance) network division ridership declined 4.5% and revenue declined 2.9%. Only one western long distance train (the Sunset Limited) and three eastern (the Auto Train, the Crescent, and the Cardinal) showed increases. Isn’t it interesting that the two tri-weekly trains showed increased demand? What does the future portend for the national system trains? For other rail services? Frank Wilner, writing for Railway Age, said, “Amtrak best find a secure hideaway that is “posted” against hunting, because come January it will be open season on passenger train subsidies.” With the already eliminated funding for high- and higher-speed rail, increases in Amtrak’s allocation may be a pipe dream. That brings us to the topic of what CAN be done to protect the two divisions that are under constant critical fire, the long distance and the state supported trains? Obviously, selling more tickets on all trains will go a long way to making them look better. But, the constraints placed on them by “car shortages,” low service frequencies for the long distance trains, and increasing cost allocations to them and the state-supported services will be continuing sore points. To say nothing of the Congress getting in the act by mandating unreasonable demands, such as the Sessions (R-TX) amendment that we have discussed here before that mandated eliminating the worst performing route (the Sunset Limited). Fortunately, that provision was eliminated from the current legislation but can be revived any time, and the Gingrey (R-GA) amendment barring use of allocated funds for food and beverage service support which still remains active. So, the political wars continue and will only get louder in the next year. Last, there is the topic of “leadership.” During the political campaign much was made of the lack of leadership in Washington. Amtrak has had its share of leadership problems over the years, and the current CEO Joe Boardman has taken his share of the criticism. Amtrak lost one of its most productive leaders when Brian Rosenwald chose to retire. That ended an era of outspoken advocacy for growth of the long distance trains inside the corporation. Trains Magazine’s Don Phillips summarized the situation in the November issue, “Boardman fiddles while Amtrak burns,” saying that Boardman pushes out those who disagree with him, so they have been losing experienced managers, plus, he has “little time to address infrastructure, equipment, and Amtrak’s long laundry list of other problems.” In early November rumors circulated that Boardman’s “successor” at Amtrak could be Joe Szabo, who has been the FRA Administrator, but Szabo denied the rumors and said that “if he had remained in Washington he would never have considered the Amtrak job.” That tells you how exciting the prospect of “leading” this organization is. This writer is now ready for a long road and rail vacation where what is really going on “out there” will be interesting to discover first hand. Look for a trip report in early December. Meanwhile, have a great Thanksgiving and be thankful that we still have passenger trains we can ride. While they need constant attention perhaps one day passenger trains will not be in so many cross-hairs. They will still be around. 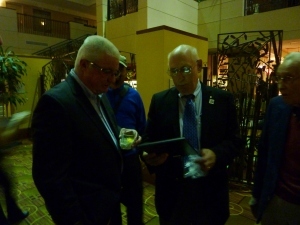 NOTE: Mr. Selden is President of MinnARP, and is the newly elected President of URPA. He will be a speaker at the RailPAC November 15, 2014 Conference in Sacramento. The challenge of operating passenger trains, and in particular the higher revenue long distance trains (Amtrak’s largest, most effective, and least subsidized services) on general purpose railroads appears to be more challenging, and more nuanced, a problem than many rail advocates perceive. All evidence is “anecdotal” of course, and this is only one anecdote, but having just completed a mid-October round trip on the Empire Builder MSP-SEA-MSP, these were my observations. But this does not mean that the Empire Builder cannot flourish, or that BNSF is acting in bad faith in its handling of the Empire Builder. First and most important, we observed numerous instances everywhere along the line between St. Paul and Seattle of BNSF dispatchers doing everything they could to keep the Empire Builder moving. They were not always successful, but it was not for lack of effort. Z-trains, stack trains, auto-rack trains, oil trains (many oil trains), coal trains, grain trains, merchandise trains–at one time or another, we met or overtook them all, sometimes holding the main and sometimes rolling through a passing track. But always affording the Builder priority. Approaching Minneapolis, our #8 crossed over near Big Lake to run around two eastbounds (one a stack train) only to duck back onto the eastbound main to meet two westbounds, over a distance of less than 20 miles. 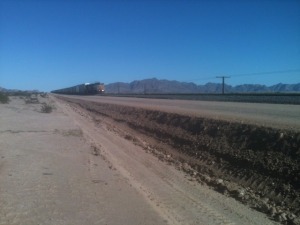 The same thing happened east of Shelby the day before, and at full track speed. 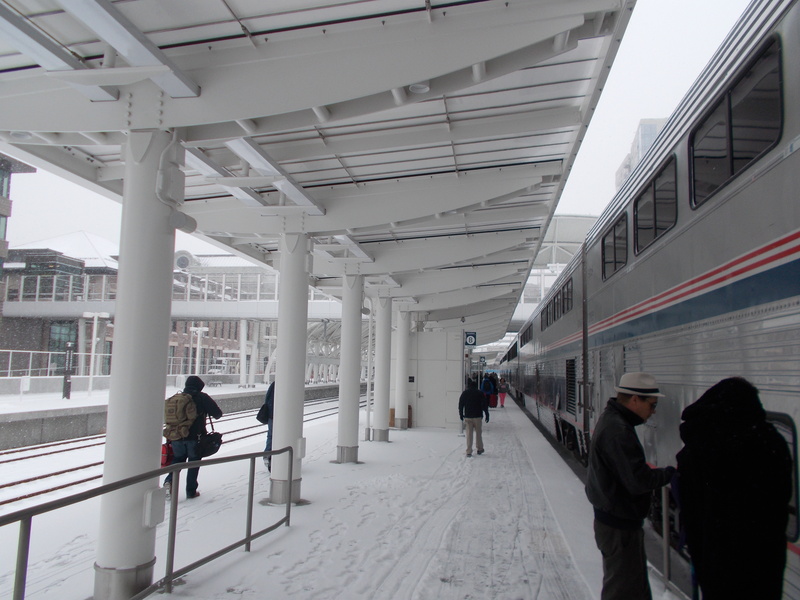 It was superb dispatching and it was done solely to benefit the Empire Builder. There were four instances on the round trip of the Builder stopping, for waits as long as an hour. One was while #8 waited for a slightly late #7 near Malta. As we later proceeded east, we could see that two intermediate sidings were plugged with BNSF trains waiting on the two passenger trains to get on their way before they could move. What did that cost BNSF? Other times, it became clear that we simply had to wait for open single track ahead. The sheer number of BNSF trains of all kinds moving on the railroad was astonishing. On the way west on #7, we met or overtook at least a dozen BNSF trains of all kinds just between Minot and Williston. Across western North Dakota, signs of BNSF’s billion-dollar private investment in its infrastructure were everywhere. A second main track is being built west from immediately west of the Gasman Coulee trestle (west of Minot) 148 miles out into Montana. Parts of it are already in service and it is already being heavily used. In many other places in western North Dakota, new yards and sidings are in place and more are being built. Work progresses on the second main track. 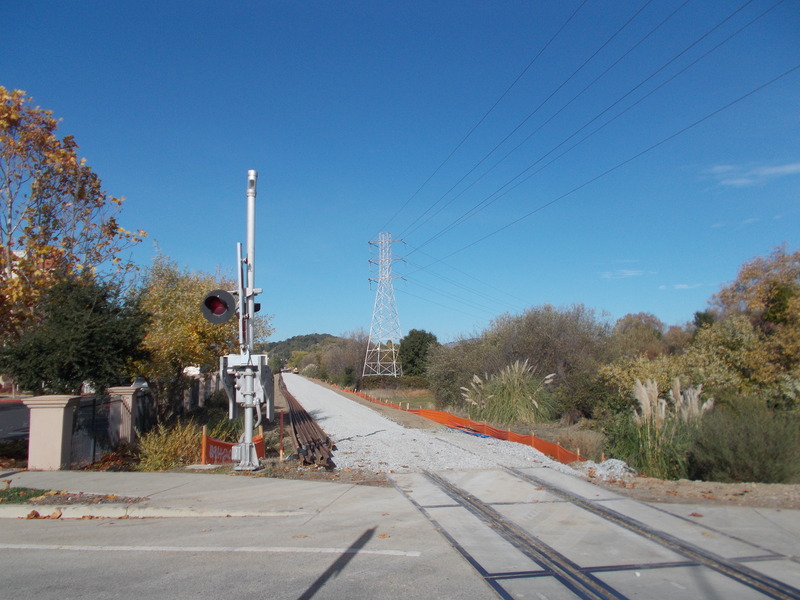 In places, tie, ballast and rail trains were working as we passed, and grading was being done in other places. Unit oil trains were much in evidence, but only as an increment to what appears to be a very robust business of all kinds for BNSF. Cuts of frac sand covered hoppers were also much in evidence. It is simply wrong to say that the oil trains broke the railroad. They may have been the last straw, but it is the aggregate effect of all the traffic that is congesting the line. And BNSF’s solution is the only feasible one, for them and for us. Obviously, BNSF isn’t spending a billion dollars of its shareholders money in North Dakota for Amtrak, they are doing it to support their own rapidly growing business. Amtrak is a collateral and probably unintended beneficiary. But the conclusion is clear that substantial new investment in rail infrastructure, driven by the healthy growth of the freight carriers, is both necessary AND sufficient, in combination with good dispatching and a dose of professional self-respect (which seems to be lacking at certain other railroads), to allow continued operation of Amtrak’s long distance trains over general purpose railroads. The trend of the host railroads investing private capital into their plants can be accelerated by prudent public policy innovation. First, every state and city that says that it values having Amtrak or other private passenger rail service should be challenged to prove it by enacting property tax abatements and credits for host railroads that make capital investments that benefit the passenger service. Second, an idea first proposed 25 years ago by Byron Nordberg should be dusted off and implemented. Rather than collect and redistribute taxes through politicized and inefficient programs like RRIF (which Amtrak is now trying to hijack to feed its insatiable need for cash to prop up the NEC), Congress should adopt a tax credit program that awards income tax credits to any railroad that makes a capital investment in its rail infrastructure that directly benefits passenger services (whether or not it also benefits the freight service). States can do the same thing. Qualification criteria uniformly applicable across the country would make the program un-political and purely merit-driven, and freely accessible everywhere. If Congress wants to keep sinking a billion tax dollars a year into the NEC (Amtrak’s smallest, weakest and most heavily-subsidized sector), it is free to do so, but a tax credit program would leverage the opportunity to get new private capital allocated elsewhere in ways that will facilitate growth and continued success in Amtrak’s most productive trains, its interregional long distance services. NOTE: Mr. Haswell is the founding father of NARP. He lives in Tucson, Arizona. The first job of any historian is to determine when a historical event began. Since Amtrak was created to deal with intercity rail passenger service, we must step back before Amtrak arrived in 1971 and see what happened to passenger trains in earlier years. 1920 saw the all-time high in peacetime for US rail passenger travel, both in passenger trips and passenger miles. However, those trains were slow – only a few achieved start-to-stop averages between given points of over 40 MPH and almost none reached 50. Locals and branch line trains were much slower. Reclining coach seats, then called chair cars, were a rarity. Air conditioning was still in the future; soot from the coal-burning steam locomotives entered freely through open windows. But the alternative for many people, unless they were lucky enough to have access to an electric interurban, was a drive over dirt roads in a Model T Ford. Rail passenger traffic did not share in the prosperity of the 1920’s. Indeed, by 1929, it had declined 35%, mostly in coaches as sleeping car patronage did not peak until 1927. Sharp fare increases after WWl did not help. By the end of the decade, trains were not much faster than ten years earlier. Meanwhile, people were driving Model A’s on an ever-increasing network of hard roads, which also benefited intercity bus service. Nevertheless, by 1930 rail travel had become fundamentally safe, and passenger service nationally still showed a financial profit. In contrast to the fortunes of many Americans, rail passenger service saw its /1 golden era” in the depression years of the 1930′ s. The widespread introduction of air conditioning coincided with the debut of the fast lightweight /1 streamliners” – the Zephyrs, Rockets, 400’s, Hiawathas and many others – which enabled spectacular reductions in travel time, sometimes by several hours. Coupled with sweeping fare reductions, by 1937 these improvements resulted in recovery of much of the traffic loss since 1929. Financially, the ’30s were a mixed bag. Overall, passenger operations began to lose money on a full cost basis, a trend that was only briefly interrupted by the World War II years. However, the new trains individually, particularly the coach services, were quite profitable. During the last year of the war, the railroads ordered lots of new equipment, hoping that at least some of the wartime traffic would stay on the trains. It was not to be. Service quality was adversely affected by an Interstate Commerce Commission order limiting train speeds in accordance with the type of signaling on given lines, and by an increase in mail, express and package business on passenger trains requiring longer dwell times at stations. By 1950 train travel was less than half the wartime peak, having been lost to better automobiles, improved roads, and rapidly expanding air services. The coming of the Interstate Highway system and the jet airplane in the late ’50s were the final blow to the ability and desire of the private rail companies to provide competitive passenger services. Meanwhile, financial losses were steadily increasing. Experiments with new designs of fast lightweight trains went nowhere. The ICC produced a major report in 1959, warning that something had to be done soon if service in many parts of the country was not to disintegrate and disappear. In the early ’60s, support for a positive solution to the passenger train crisis began to develop. 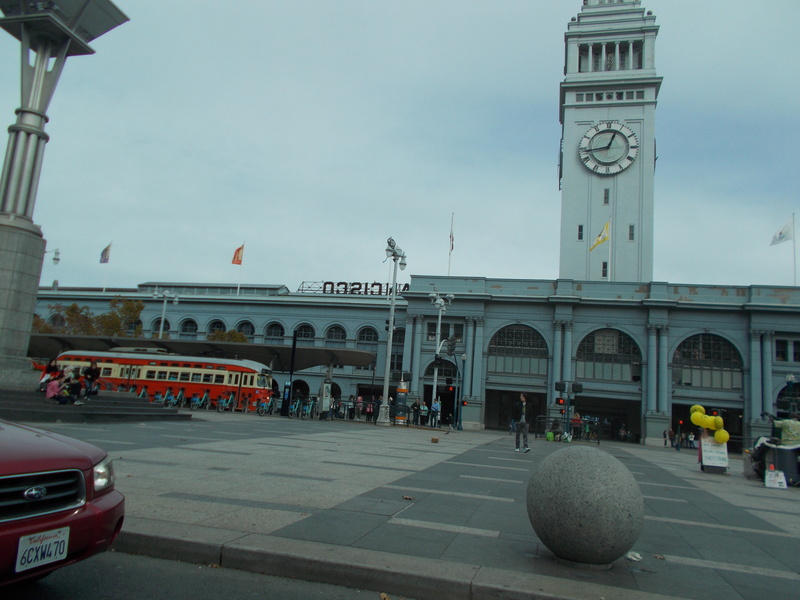 A Congressional committee released a report suggesting that all intercity passenger services be consolidated into a single national entity. Senator Claiborne Pell of Rhode Island became the leading advocate for preserving and improving service in the densely populated Northeast Corridor between Boston, New York, Philadelphia and Washington. After a modest respite in 1966, financial losses on passenger trains reached an all-time high the following year. The initial reaction of Congress was to consider a massive subsidy bill to reimburse railroads for their losses on a 0 fully allocated” basis. Since this would have given the companies more than they could have saved were all service eliminated, it was looked upon as a “railroad welfare” program and did not get Congressional support. Meanwhile the Department of Transportation, while not an enthusiastic supporter of passenger trains, concluded that substantial elimination of the service was not politically feasible and explored other options. It decided to create a for-profit national entity which would relieve the railroads of the financial burden and hopefully would become profitable through good management and the economies of consolidation. Senator Winston Prouty of Vermont became the champion in Congress of this approach. in other parts of the country, but western Senators who feared loss of trains in their states opted for a single national organization. In late 1970 Congress passed and sent to President Nixon a bill creating “Railpax”, soon to be renamed Amtrak. The President felt that the bill would simply transfer the passenger service deficit from the railroads to the government and briefly toyed with vetoing it. He signed it under pressure from the railroads and fear of the political consequences of a veto, but the passage of time has proven his concern valid. The bill called for creation of a “basic system” of passenger service by the Department of Transportation which would be provided by Amtrak by paying the railroads to run the trains. That chore was completed in April 1971 and resulted in about a 50% reduction in passenger service across the country when Amtrak commenced operation in May. Some of the choices were questionable, including continuation of less than daily service between New Or leans and Los Angeles and routing of Chicago-Los Angeles service via Flagstaff rather than Tucson and Phoenix. liquidated and the trains discontinued. When 1973 arrived, it was clear that Amtrak was losing money and would continue to do so. The Congress reacted by appropriating enlarged and ongoing funding. By this time the President was politically weakened by the “Watergate” scandal and was in no position to veto a popular and relatively non-controversial program. Unfortunately, in 1997 when Downs proposed steps to reduce Amtrak’s labor costs, the Amtrak Board of Directors, responsive to the labor organizations, forced him out of his job. So where is Amtrak today and where is it going? Its current performance is not inspiring. Unfortunately trains on most Amtrak routes are slower than comparable trains of 1941 and have a mediocre on-time performance. On-board services are inferior to those of many years ago. Outside of the Northeast Corridor, major improvements are being planned and driven at the state level – e. g., the high-speed projects in California and Illinois – while Amtrak seems content to “keep ’em rolling” and make no waves. is not, the consequences are very clear – witness the many years of unreliable operation of the Sunset through Tucson and the current problems facing the Empire Builder across North Dakota and Montana. There is no easy solution short of exclusive rights of way for Amtrak trains, which is not economically feasible outside of high density corridors. system for the fifth year in a row. 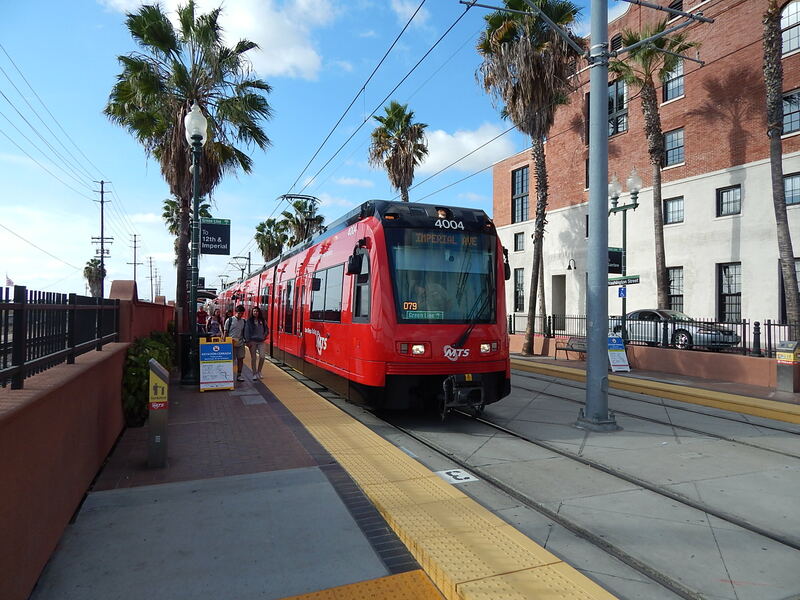 up by 11% compared to weekend ridership in September 2013. 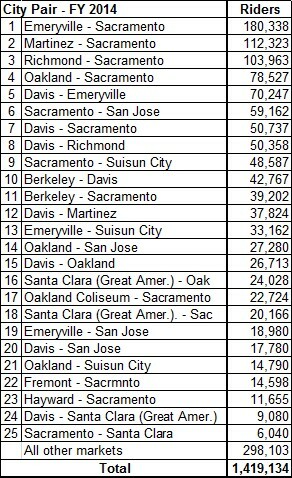 This spectacular growth was primarily due to heavy ridership on trains serving the regular season 49ers games at the new Levi’ s Stadium, which is adjacent to the Great America/Santa Clara Station. on the tracks running through the Oakland Embarcadero. from 5% mode share four years ago to 11% today. 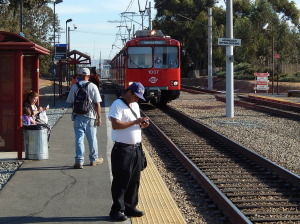 bicycle eLockers at 13 of the 17 stations Capitol Corridor serves. London, and Fremont stations will begin. equipment on the Caltrain route is installed and ready for testing. CEQA and NEPA environmental documents. Staff will continue discussions with the affected resource agencies and the cities of Roseville and Sacramento. reliable, and high-quality transport service. expansion programs contained in the most recent CCJPA Board’s Vision Plan.